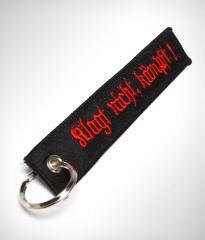 Key tag, KLAGT NICHT - KÄMPFT! Last in stock In stock 1 . Also available in our walk-in store. DON'T COMPLAIN - FIGHT! This tag encourages anyone to stop their whining and start putting the boot in. Measurements 12,5 x 2,5 cm. I bought six of these. Though I speak no German it doesn't matter at all. Somehow they're special to me and I've just ordered two more.